So, you want to build a pitch deck? This can be a daunting task for even the savviest entrepreneur. You are likely an expert in your field, know your customers like the back of your hand, or have built something really amazing. You spend most of your day (and night… let’s be honest this isn’t usually a 9-5 endeavor) working on your business, building it, growing it, getting it to the next stage. Eventually, that next stage leads you to… drumroll.. the pitch deck! A pitch deck (also called an investor deck, pitch book, pitch presentation, and other synonyms) is an important document for any company. No matter how big or small. Often you’re looking for investment, exposure, team members, mentors, or clients when you first hear about / start looking into the art of the pitch deck. While there is an insane amount of depth I could go into to dicuss pitch decks, and how to create them, I’ll hit the high points in this article. Overtime we’ll write some more in depth explorations of various parts of this process. When we do, I’ll add some links below. Subscribe to our mailing list or RSS feed to be updated on new articles! Ok, so this one is pretty obvious. To create a pitch deck for your company or concept, you’re going to have to have one first. It really is rarely too early to get started working on your pitch presentation. But you do need something. What is the idea? What is the product? Who does it serve? What are you working on? Make sure that you’ve got the building blocks of your business laid out. This is the foundation of your pitch. It is that which the whole thing will be about. We’re pitching the business: specifically the opportunity to invest, to buy the product, to sponsor the cause or to join the team. When preparing to put together your pitch presentation, you need to know who you are pitching to. Think about what they care about? What are they going to get out of it? If your pitching an investment opportunity, who are these potential investors? What do they usually invest in? Why is your investment a good deal / safe bet / big opportunity? If you’re pitching to potential clients, think about who those clients are? What are the challenges they face? How does your product make their life better, easier, more profitable, etc. Think through what your end goals are. This will frame everything you put together in your pitch. You’ll never be able to achieve them if you don’t ask for them. Close every pitch with the next steps. The call to action. Make it really easy for your audience to do what you want them to do. Contact you with questions? Sign up for updates? Join the team? Sign up for a live demo? Know what you want, and lead your audience to that next step. You are a busy entrepreneur. Your days are filled with wearing many hats, and putting out many fires. Be aware that putting together your pitch deck is not going to be a 2 hour, Friday afternoon task to check off your list. We find that founder who put together their pitch deck on their own entirely, tend to take a minimum of 8- hours for the entire exercise. More if the founder does not have a natural design-eye. Make sure that you factor in enough time to work on your pitch deck. Alternatively, factor in time to work with a designer. A pitch deck professional can reduce the amount of effort you put into your pitch down to a couple highly focused and effective hours. For example most of the pitch decks we create tend to use about 2-3 hours of our clients’ time. That’s because we use a variety of tools and techniques to streamline the process, and as experts in business, storytelling and design, can bring all of the messaging together in a way that would take significantly more research, rework, and iterations without us. Plan time to work with designers before scheduling your big pitch too. To make sure it’s pitch perfect, plan on a few weeks to finalize the pitch deck. What is the product offering / tiers of service? What is unique about you / what you do? To make your case compelling, believable and rooted in the truth, you are likely going to need well researched information. There are many ways to define a market size or to splice up market segments. The Three R’s rule for statistics: Make sure that you always find relevant, recent, and realistic data to back up your arguments. The worst thing is being called out for old data or unknown or distrusted sources. Once you’ve gathered all of this relevant content, you’ll need to start sifting through it to pull out the compelling message and a story line or thread along which you will build your pitch. Contrary to MANY blog posts out there, there are NOT 10 slides you need in your pitch deck. There is no one way to create your pitch, and it should be completely unique to you and your company once you’re done with it. The worst thing you can do it follow a tired script, and simply fill-in the blanks on the “top slides.” Your pitch is not a collection of answers to common questions. It should have a clear story arc, a flow that brings the audience along with you on the journey, and a clear and compelling conclusion. If you’re looking for funding, you’re going to need financials. These are the past and projected revenue and expenses of your venture. Investors will clearly need to review these financials in detail during the due diligence phase of your discussions with them. Your pitch will cover and contain the high points and the major financial sign posts that interest an investor. But, it won’t be everything. You need to make sure you also detailed excel spreadsheets with pro formas, assumptions, projections, etc. To create an effective and consistent pitch deck, you need a clear brand. If you’re company does not yet have a logo that you love, make sure that you have one created. Here at pitch deck fire, we look at pitch decks holistically as a part of the greater whole of your company’s external messaging. So we have in-house logo design experts that our clients often utilize to make sure their brand is on-point as we build their pitch deck. Gather your logo files, your color schemes, your consistently used images and graphics. You’re visually telling your story, and it needs to feel cohesive with every other piece of material that your audience may also see. Your website, your sales deck, your one pager, your business card, your handouts, your social media streams. Tell one story. Pitch decks are essentially visual documents. They are also often used as visual aids during live presentations. As such, more often than not they are creating using slide design tools. Check out our recommended pitch deck design tools here. The most commonly used is of course the tried and true Microsoft PowerPoint. When used right, these tools can be powerful platforms for creating visually stunning pitch decks. Though when used poorly, it can be used to create text-heavy, uninspiring, stale and cookie cutter presentations. In addition to a slide design tool, pitch decks should be chock full of graphics, icons, and images. Using a pitch deck design expert can dramatically increase the effectiveness and professional appeal of your pitch deck. Their eye for not only the story and overall message, but also the professional and visually appealing design is very valuable. Start working with a designer as early in the pitch deck creation process as possible for best results. Know that your pitch deck is a live document. It lives and breathes and changes just like your business does. Your projections and go to market strategy evolve as your industry, customers and competitors shift and change. On top of that, each time you use a pitch deck for a different purpose, or a different audience, consider their new point of view and needs. You very likely will want to create different versions of your deck for different audiences (ie: an investor deck vs. a sales deck or client facing pitch deck), and for different uses (ie: presenting live vs. sending as a visual document). Make sure you work with a designer who gives you the source files for your deck AND is available to you over time for updates. If you’re preparing for any live / in person pitches, you should start to pitch as soon as you can. There are a lot of local opportunities to pitch in your town. 1 Million Cups can be a great resource, as is House of Genius. Lots of cities host pitch competitions as well. Practice in front of strangers as much as you can, it’s the closest thing to the real deal. Practice like you’re going to play. If you need specialized help, we offer pitch review and coaching services that our clients find very valuable. Multiple sessions allow you to iterate on your pitch, and fine tune your delivery to that you’re fully prepared when you step into the room / on to the stage for your big pitch. Whew! There you have it. How to build your pitch presentation from the very first step, to the very last. I hope this guide helps you to understand the whole process of putting together your pitch deck, and prepares you for success as you embark on this exciting journey for your company.  If you need any help, or just want to talk to an expert, feel free to reach out to us here at Pitch Deck Fire.